22 || P R I N T W E A R S E P T E M B E R 2 0 1 5 GRAPHICS HOT SPOT B Y W A Y N E P O T T E R B lack, white, and shades of gray in a heat transfer design can convey mood and feeling. However, a T-shirt design really does not come alive until color is added. Color is an essential component of any design and substan- tially increases brand recognition. Remember the candy colored iMacs that turned a two-year $1.8 million loss into one of the world's top cash cows? By introducing color into the computer marketplace, Apple declared, "It does not have to be beige to be good computer." There are many other examples where color has contributed to marketing success, and in terms of apparel decorating, stock heat trans- fers changed the game by allowing anyone to decorate a shirt with a colorful design using just a heat press. THE CURIOUS CASE OF "THE DRESS" Remember earlier this year when social media boiled over with an intense debate about a pho- tograph of a dress? Was it blue and black or white and gold? The majority of the people polled saw white and gold while a smaller percentage firmly insisted the dress was blue and black. A number of theories were ban- tered about as to why the photo looked so com- pletely different to different people. In all, it comes down to color perception. When the signals about ambient light are missing, people perceive the same color in different ways. Most of the scientific types agreed that this drastic difference is probably related to the variations in the number of photo- receptors in the retina that perceive blue. It seems that light enters the eye and is focused by the lens on the retina where pigments fire neural connections to the visual cortex of the brain. The brain then processes the signals into an image. Without ever having to worry about it, our brain fig- ures out what color light is bouncing off a design. 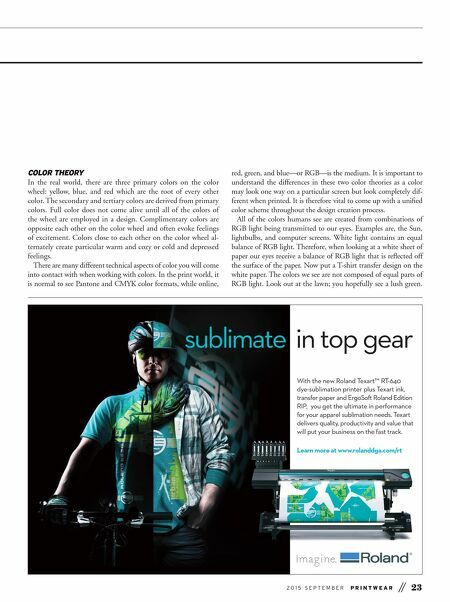 Since color is so important when producing digi- tal heat transfers, it needs to be rendered correctly as it is designed. In the case of digital heat transfers, the process is best trusted to your color laser-print- ing device. 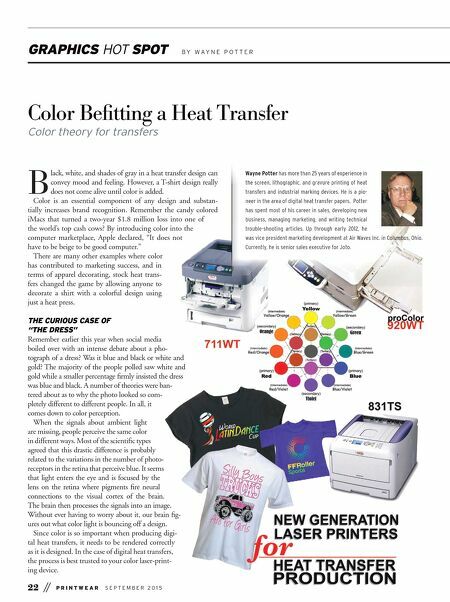 Color Befitting a Heat Transfer Color theory for transfers Wayne Potter has more than 25 years of experience in the screen, lithographic, and gravure printing of heat transfers and industrial marking devices. He is a pio- neer in the area of digital heat transfer papers. Potter has spent most of his career in sales, developing new business, managing marketing, and writing technical trouble-shooting articles. Up through early 2012, he was vice president marketing development at Air Waves Inc. in Columbus, Ohio. Currently, he is senior sales executive for Joto.